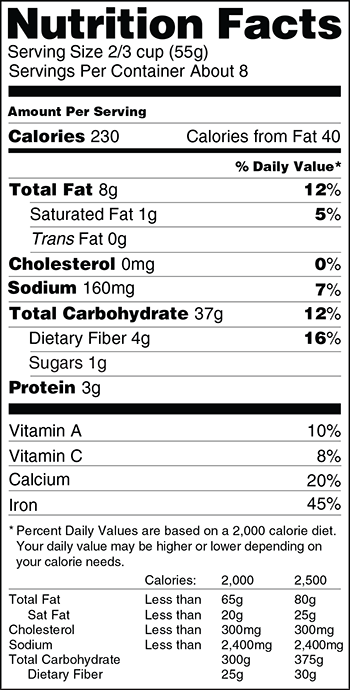 If you haven’t already heard, the Food and Drug Administration (FDA) is proposing to change the way nutritional information is presented on a food label. In the new label, for example, calories and serving sizes will be emphasized, and added sugars will now be listed in a separate category. To visually represent the suggested changes, take a look at the current label (left) compared to the proposed label (right). The FDA’s goal, apparently, is to provide a label that better reflects the reality of what Americans are actually eating, rather than what experts think they should be eating. Ah yes, the ever evolving muffin. What was once the tiny manifestation of only a few earthly gifts – sourdough starter, wholewheat flour, egg, butter, sugar (and a few more ingredients) – has, over time, been significantly blown up and transformed into a byproduct of the latest technological advancements – refined white flour, a scoop of fortified vitamins and minerals, genetically engineered vegetable oil, high fructose corn syrup, aluminum-rich leavening agents, etc. But it must be the nutrition facts label – with its misrepresented serving size and difficult-to-find calorie content – that has been causing all the problems … right? Only in modern Western civilization can claims like these be made on heavily processed foods (Cherrios helps to lower cholesterol, apparently), while the majority of medicinal plant organisms, with extensive traditional applications and modern research to validate their efficacy, are relegated to the ranks of unproven, unfounded alternative therapies that ought to remain subordinate to the almighty conventional medical system. An interesting paradigm, for sure. The FDA, confused as to why the health of Americans is deteriorating, believes that the solution involves aesthetics. After all, the only changes being proposed address words and numbers – not actual food quality. How is the emphasis on serving size and calories, by increasing the size of the text, going to improve the health of consumers? As far as I’m aware, most consumers can see just fine. 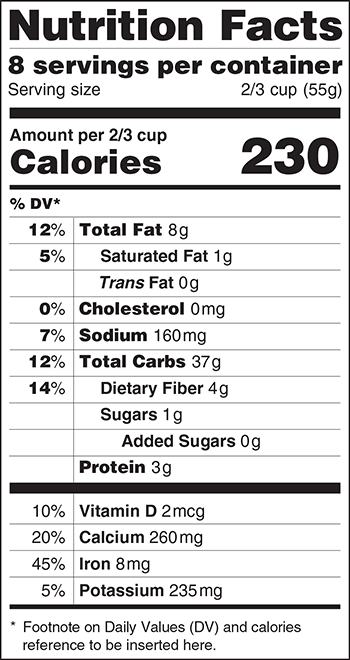 In the event that a consumer would care enough to inspect the nutrition label, I’d imagine that he or she would, sooner or later, locate the calorie content (note: if you have trouble finding it, check out the number next to the bold word, “Calories”). Words can be highlighted, new categories can be added, and claims can be littered all over the package, but this will do very little to reverse the deteriorating health of junk food addicted Americans. What the FDA doesn’t seem to realize is that the ingredients that comprise a food are far more important than the nutritional facts that represent the food . Essentially, quality trumps quantity. Is it really advantageous to know that a food is low fat, low cholesterol, and low sugar, when the product is made with antibiotic-laced dairy, genetically engineered soybean oil, and artificial sweeteners? There ought to be more emphasis on what’s actually in a particular product by drawing attention to the ingredient list, for this list can tell a person much more than extra-large numbers on a nutrition facts label could ever reveal. For example, the proposed labels will feature vitamin D content. Let’s imagine that a certain food-like-product is high in vitamin D. So what? It was synthetically added to the hormonally-altered pasteurized low-fat milk, after the original vitamin D was thrown out with the rest of the critical nutrients, like saturated fat (yes, it is necessary for health) and fat-soluble vitamins. I’d rather know about the source and quality of the milk, which could be derived from the ingredient list, than the limited nutritional profile that the FDA requires. Give me any two food products, and I’ll tell you which one is almost certainly more optimal for the human body just by reading the ingredient list. Let’s not forget that the proposed labels do nothing to address the issue of genetically modified organisms (GMOs) in our food supply. With the increasing desire for GMO labeling in America (a recent Mellman Group survey found that 91% of voters supported GMO labeling), and the lack of consumer interest to emphasize serving size and calorie content on nutrition facts labels (no one is marching around Washington with signs exclaiming “Increase Calorie Font Size!”), why, on this beautiful Earth, is there such a push to address the concerns of the latter, while the desires of GMO labeling advocates are continually dismissed? Ultimately, the FDA’s proposed labels seem like a precarious step sideways (even, perhaps, backwards) … not a huge step forward. If it plans on seeing any significant changes, it must acknowledge the fact that America’s commercial food supply hardly contains any real food whatsoever. When the majority of food products are just different permutations of corn, wheat, and soy (think subsidization has anything to do with their ubiquity? ), we’ve got a problem. When the text size of “calories” requires magnification, we’ve got a problem. When the majority of Americans demand labeling of genetically modified organisms, and that demand is ignored, we’ve got a problem. When the focus on food shifts to isolated nutrients, numbers, and percentages, instead of what’s actually in the food, we’ve got a problem. So, we’ve got a problem. No worries, though, as there is a fairly simple solution. Eat real food. Food that comes from the Earth. Eat lots of food that doesn’t even require packaging, as most products that require labels you could probably do without – and still thrive. Even better, grow your own food, or harvest the food from the wild. Labels are products of civilization; the foods of civilization are the ones that got us in this mess in the first place. You don’t need an expert, a professional, nor the FDA to tell you what’s good for your body. Are they paragons of optimal, adaptive health anyway? Essentially, don’t outsource your health. Take responsibility for it, in every area of life. And trust your intuition – you already know which foods are best for you. ← Nutritional Differences Between Maple Syrup Grades – Which Is Best?